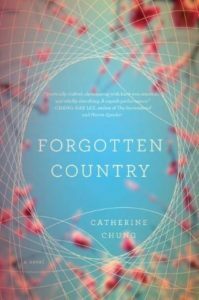 Forgotten Country by Catherine Chung. Fair Use. Honestly I don’t have much to say about this book other than it ripped my heart out and the ending didn’t satisfy me nearly enough, although looking back I get why the author ended it the way that she did. Forgotten Country is the story of two Korean-American sisters, Janie and Hannah. Their complicated relationship, or lack of one, colors every page of the book. I was born in America and so were my parents and their parents, so I can’t imagine what it’s like to have to move to a new country and suddenly acclimate to a new language, culture and way of life. Janie and Hannah moved to America with their parents when they were young girls, and acclimated to their new country quicker than their parents did. Their father’s older sister, Komo, comes to stay with the newly-settled family soon after they arrived, bringing her own family with her. Janie and Hannah’s cousins, Gabe and Keith, are polar opposites and their childhood interactions set a path for a collision course between the sisters, twenty years later. The family moves back to South Korea when the girls are adults, because of a new, possibly lifesaving medical breakthrough in the country. But Hannah doesn’t return to Korea with them, instead staying in Los Angeles – and it’s Janie’s responsibility, as per her parents’ wishes, to tell Hannah about the move to Korea and convince her sister to return to their birth country. Pretty much the entire book, I sympathized with Janie and thought that Hannah was kind of awful, honestly. She was selfish, cruel and literally just disappeared without a word to her family, or anyone. I didn’t understand why she could just turn her back on her life and her family like it was nothing. After a fairly significant plot twist involving the sisters at the end of the book, I felt like I understood Hannah more. That being said, her character still made me very angry for 90% of the novel and I’m not sure if one plot twist redeems her, in my eyes. It was definitely an excellent read, though, and I started and finished it in a day – I couldn’t put it down. I’m a sucker for family dramas and stories about complicated, human relationships, and this novel was excellent in both aspects.